Two-thirds of Americans (67%) say there is solid evidence that the earth has been getting warmer over the last few decades, a figure that has changed little in the past few years. While partisan differences over climate change remain substantial, Republicans face greater internal divisions over this issue than do Democrats. 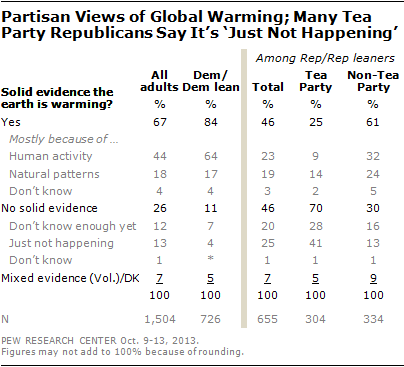 Just 25% of Tea Party Republicans say there is solid evidence of global warming, compared with 61%of non-Tea Party Republicans. The national survey by the Pew Research Center, conducted Oct. 9-13 among 1,504 adults, finds that most people who see solid evidence of global warming – 44% of the public overall – say it is mostly caused by human activity, such as burning fossil fuels. Just 18% say it is mainly caused by natural patterns in the earth’s environment. Among the 26% of the public who say there is no solid evidence of global warming, about as many say “it’s just not happening” (13%) as say “we just don’t know enough yet about whether the earth is getting warmer” (12%). Opinions of Republicans and Republican-leaning independents divide into four roughly equal size groups: 23% say there is solid evidence of global warming and it is mostly caused by human activity; 19% say warming exists but is due to natural patterns; 25% see no solid evidence and say it is just not happening; 20% say there is no solid evidence but not enough is known yet. Among Tea Party Republicans, the largest share –41% – says that global warming is just not happening, while another 28% say not enough is known. Among non-Tea Party Republicans, just 13% say global warming is not happening and among Democrats and Democratic leaners, just 4% express this view. Democrats are far less divided over global warming than Republicans, although liberal Democrats are more likely than moderates and conservatives to say that global warming is mostly caused by human activity (75% vs. 58%) rather than by natural patterns. 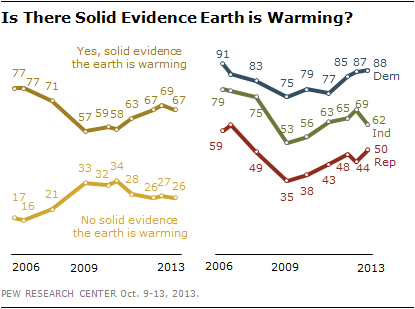 Overall, two-thirds (67%) of Americans say there is solid evidence that the earth has been getting warmer. These views have changed very little in the last few years. Far more see solid evidence of global warming than did so between 2009 and early 2011. But when the Pew Research Center first asked this question in 2006, 77% said there was solid evidence that the average temperature on earth had been increasing. Since 2009, there has been a steady increase in the share of both Republicans and Democrats who say there is solid evidence of global warming. In 2009, 35% of Republicans, 53% of independents and 75% of Democrats said there was solid evidence of rising temperatures on earth. Today, half of Republicans (50%), 62% of independents and 88% of Democrats say this. However, fewer Republicans and independents have this view than in 2006; at that time, 59% of Republicans and 79% of independents said there was solid evidence of rising global temperatures. Is Human Activity the Cause? Views about the primary cause of global warming have followed a similar trajectory. Currently, 44% say there is solid evidence of global warming and it is mostly due to human activity; 18% say it is mostly because of natural environmental patterns. Two-thirds of Democrats (66%) now say that warming is mainly because of human activity, up nine points from earlier this year. Fewer independents (43%) and Republicans (24%) than Democrats say that human activity is the primary cause of global warming. 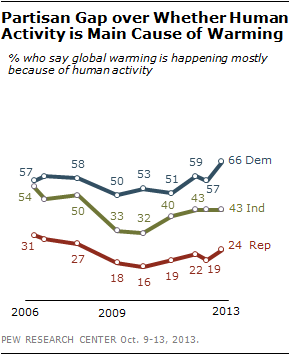 Among Democrats, there are sizable educational differences over the main cause of global warming. 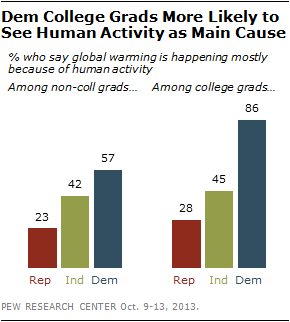 Fully 86% of Democrats with college degrees say that the earth is warming and this is mostly due to human activity. Among Democrats with less education, 57% express this view. By contrast, similar percentages of Republican college graduates (28%) and those who do not have a college degree (23%) say that human activity is mostly responsible for global warming. A majority (54%) now say that scientists generally agree that the earth is warming because of human activity, while 37% say that scientists do not generally agree. A year ago, opinion was evenly divided: 45% said scientists generally agreed, while 43% said they did not. 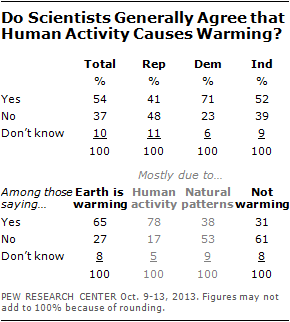 Most Democrats say there is scientific consensus on global warming (71%). Only 41% of Republicans say that scientists generally agree, while 48% say they do not. Perceptions of where the scientific community stands on global warming are associated with individual views on the subject. About three-quarters (78%) of those who say human activity is the primary cause of global warming think that most scientists generally agree. About four-in-ten (38%) of those who say warming is mostly due to natural patterns in the environment think scientists generally agree that human activity causes global warming. Among the 26% of Americans who say there is not solid evidence of global warming, 31% say there is scientific agreement that human activity is responsible for global warming, while 61% think there is not agreement among scientists. Possible to Reduce Effects of Global Warming? While there may be disagreement over whether global warming exists, most (74%) of those who say there is solid evidence of rising temperatures on earth believe it is possible to reduce the effects. Just 23% say it is not possible. 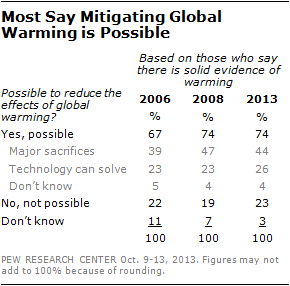 When asked if major sacrifices will be needed to reduce the impact of global warming, 44% say they will be needed, while 26% say that technology can solve the problem. On both of these questions there has been little change in the last five years.